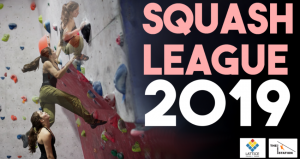 The Squash League is returning for 2019. As with previous years we will set 100 problems over the course of 7 rounds. Unlike our other competitions, the number of attempts taken on each climb does not affect your score. You get one point for every problem that you complete. The age based categories will be determined by your age at the start of the comp (27th February). Entry costs just £5 for the whole competition. The top three in each category will be offered prizes kindly donated by our sponsors. Thanks to Lattice Training and Rab for supporting this event. The first round will be ready for 17:00 on 27th February.